Airfix was started in 1939 and, since it produced its first plastic kit in 1949, has grown to be the United Kingdom's leading model kit manufacturer. Several generations of young and young-at-heart modellers have made Airfix kits and, despite turbulent times in the 1970s and 1980s when the company changed ownership several times, in the twenty-first century it goes from strength to strength under the wing of Hornby Hobbies. The 1960s and early 1970s might be called the vintage years of Airfix, when some of their best and most popular kits were produced. For ten years up to 1974, renowned artist Roy Cross produced some of the stunning paintings that appear on the boxes of Airfix kits of the era. Roy set the standard for such artwork, to the extent that many are still used today, four decades later. 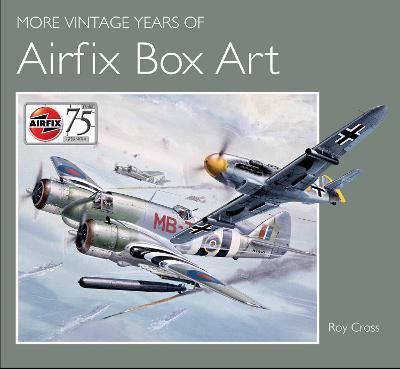 Roy Cross's The Vintage Years of Airfix Box Art contained a host of the paintings he prepared for Airfix, but the unearthing of many more images in old Airfix files has enabled this entirely fresh look at Roy's work to be presented, coinciding with the seventy-fifth anniversary of the first Airfix kit. Thus the remainder of Roy's ten years' work for Airfix is reproduced here. Roy Cross RSMA GAvA began work as an illustrator in Fairey Aviation during World War Two. Over the next thirty years, Roy progressed from line illustration, via colour artwork, to topclass advertising art for the aircraft industry and other companies, including Airfix. For ten years he supplied artwork for Airfix and in 1974 he left and set out on his own, following a love for painting ships and the sea. He still paints and his glorious paintings can still be found today in art galleries and in private collections. Sadly, much of his Airfix artwork was destroyed all that remains of much of this superb artwork are the lids of many millions of boxes.